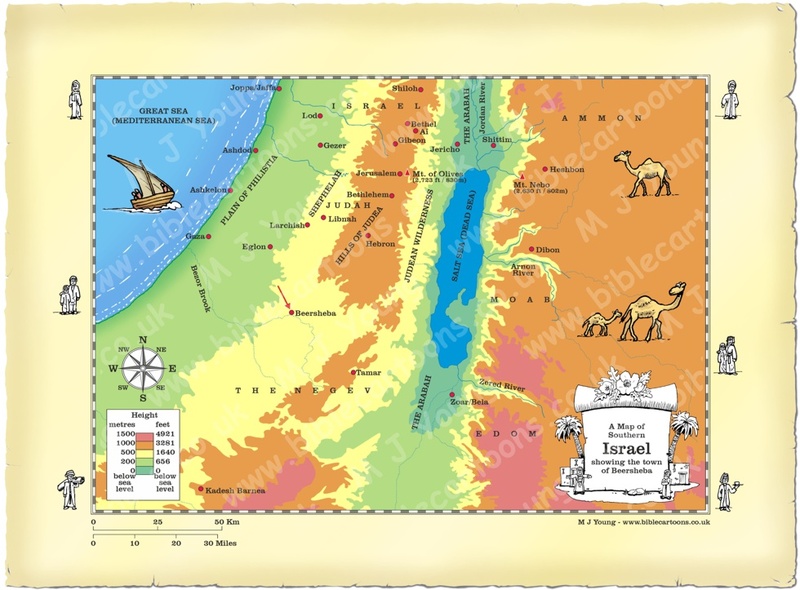 This is my map of Southern Israel showing Beersheba. The first mention of Beersheba is in Genesis 21:14-21, which tells the story of Hagar and Ishmael in the wilderness. In this narrative God opened Hagar’s eyes and she saw a well of water that saved her and her son’s life. The name Beersheba is defined as “well of the oath” by Abraham in Genesis 21:31. Water-rich Beersheba was once the home of each of the major Hebrew patriarchs, Abraham, Isaac, and Jacob. Later on Beersheba was an important Israelite center for worship, until the destruction of its altar and the removal of its priests under the reforms of King Josiah in the 7th century B.C. Winter water travels from the Hebron Mountains into the valley of Beersheba and is stored underground in vast quantities. The main river (the Beersheba Stream) is a wadi which floods in the winter. The Kovshim and Katef streams are other important wadis which pass through the city. The Valley of Beer Sheva has been populated for thousands of years. From an archaeological site a few kilometers northeast of modern day Beersheba, findings suggest that the region has been populated since the fourth millennium B.C. The city was destroyed and rebuilt many times over the centuries. 14 So Abraham got up early the next morning, prepared food for the journey, and strapped a container of water to Hagar’s shoulders. He sent her away with their son, and she walked out into the wilderness of Beersheba, wandering aimlessly. 15 When the water was gone, she left the boy in the shade of a bush. 16 Then she went and sat down by herself about a hundred yards  away. “I don’t want to watch the boy die,” she said, as she burst into tears. 19 Then God opened Hagar’s eyes, and she saw a well. She immediately filled her water container and gave the boy a drink. 20 And God was with the boy as he grew up in the wilderness of Paran. He became an expert archer, 21 and his mother arranged a marriage for him with a young woman from Egypt. 30 Abraham replied, “They are my gift to you as a public confirmation that I dug this well.” 31 So ever since, that place has been known as Beersheba—“well of the oath“—because that was where they had sworn an oath. 32 After making their covenant, Abimelech left with Phicol, the commander of his army, and they returned home to the land of the Philistines. 33 Then Abraham planted a tamarisk tree at Beersheba, and he worshiped the LORD, the Eternal God, at that place. 34 And Abraham lived in Philistine country for a long time.